This update to highway9pictures.com has been long in coming. The last time the site was updated (a little over a year ago) it was to replace a very simple, all-HTML, site that hadn't been changed much since Ocean City was making the festival rounds. The desire to have a slicker, and most importantly, more active and engageable site led me to Squarespace and to the below design. It was certainly a big step forward from where I'd been. I got to take advantage of some of the design work the immensely talented David Robinson graciously did for me - the background image is an early (and David would ask me to say) unfinished version of what eventually has become the Highway 9 title card. I also got to integrate social media, and embed video in a much more reliable fashion than I had in the past. But, if I'm honest, I never quite got it as good as it could be... and I certainly didn't live up to my stated goal of posting news and observations in this blog as much as I had hoped. But it's a new year right? And what's more, Squarespace has rolled out their new system, Squarespace 6, which is chock full of new goodness that I hope take advantage of here. So here we are then. Highway9Pictures.com v3.0. It still features the work of Mr. Robinson in the backgrounds (and I know he would once again ask me to add that it is not 100% finished... that I'm jumping the gun on him again like I did last year). I hope you enjoy looking around, and if you see anything that seems out of whack, or there's something missing, please let me know in the comments or via the handy contact form. Of course, it's still very much a work in progress overall. But it's a good start to what will hopefully be a good year. "Raymond Carver Moments" played the Valley Film Festival not long after I moved to L.A. It was a great experience, and the first fest I'd been a part of since "Ocean City" wrapped it's fest run. So it's very exciting that I get to do it again this year with the short film version of C&E. What's even more exciting, is that we'll be playing as part of a shorts program devoted to VFF alums, including my dear friend Ashley Cozine. Ashley, a fellow Tisch Grad is a talented Actress and Producer, and actually had a hand in the formative stages of C&E. The script for the original short was first read during a writer's group she organized, and later, it was Ashley who tipped me off about the NYU WEB SERIES SHOWCASE. Ashley will be at the fest with her film "Desert and Suicide", a dark comedy about blind dates. You can watch the trailer here. The 2011 VFF will run from 11.11.11 through 11.13.11, with all screenings taking place at the Whitefire Theater in Sherman Oaks, CA. THE FURTHER ADVENTURES OF CUPID AND EROS will be screening at 7:00 pm on 11.11.11. Info and tickets here. Interview with BBC Radio 5's Outriders! On Tuesday September 27th, Jamillah Knowles of the BBC Radio 5 Live’s Outriders, a show dedicated to exploring the frontiers of the web, took some time to chat with me about Cupid and Eros and creating Web Series independently. To say that being on the air/intertubes of the BBC was a ridiculous geek thrill for me would be putting it midly. Jamillah was a fantastic interveiwer and I had a great time chatting with her. Hopefully listeners found it fun. One of the coolest things about how this came about is that it was actually a C&E fan named Seth Skaggs, who set the whole thing up. Seth, who tweets as @armlessphelan, discovered C&E via social media and since then he's been a great supporter of the show, on and offline. He put us in touch with Jamillah after having had a chat with her over twitter. Just one example of how truly awesome it is be able to interact so directly with fans. And as an added bonus, Jamillah let me post some web series picks of my own, so I got to give some shoutouts to shows and creators I dig. All in all, a pretty great experience. I'm thrilled that ITVfest has recognized the outstanding work Josh has been doing on "The Further Adventures of Cupid and Eros"
Josh was cast late in the process of preparing C&E after another actor had to bow out due to an injury. He came in with less prep time than anyone else, yet immediately stepped up to the plate and did amazing work. One of the real pleasures of working on the show has been watching him make the role his own, and watching as he and his co-star Jo Bozarth (Eros) developed an on and off-screen friendship that really is the heart of the series. I of course think he deserves to win, hands down. But no matter what happens at the awards gala on August 12th, I'm happy he's getting some recognition for talent. If you're curious you can see the full list of nominees here. I'm excited to announce that "The Further Adventures of Cupid & Eros" is an official selection of the 2011 International Television festival. It's always exciting to get into a festival, but it's especially gratifying to be in the company of some of my favorite shows and creators. Working on a web series means your don't often get the chance to watch your show with an audience. I'm really looking forward to the chance to do that with some of our season 1 episodes at ITVF. The complete list of selected shows can be found here. If you're looking for some new shows to check out on the web this list would be a great place to start. The fest runs from August 5th-11th here in Los Angeles and as soon we know when C&E is screening we'll be posting that info here and on cupidanderos.com. For more info on the fest, you can go to ITVFest.org and also check out their Facebook Page. 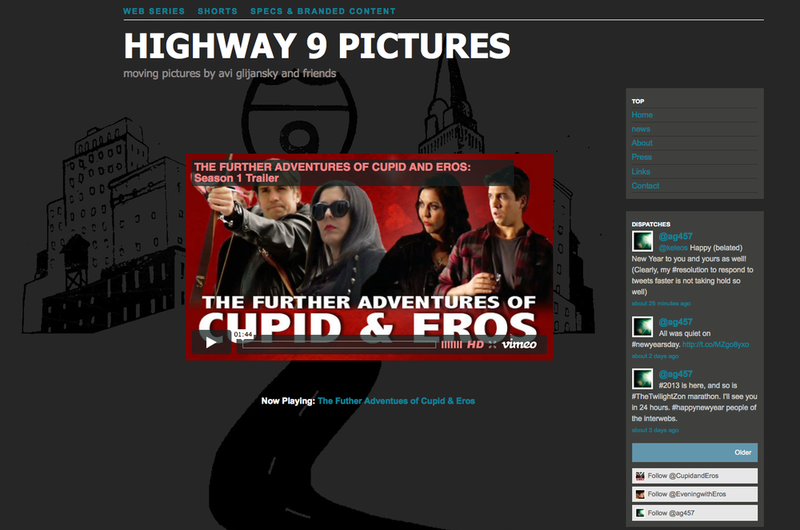 Welcome to the New Highway 9 Pictures Blog! Hi there. Thanks for taking a look at my little corner of the internet. The update to the Highway 9 Pictures site has been a very long time in coming. To let you know about any and all exciting happenings related to my work, or the work of my collaborators. As a place to discuss my thoughts on the work of myself, my friends, and my colleagues and the things I'm continually learning about my craft and my business. I know that's not the grandest mission statement in the world, but I hope the content here will nonetheless be worth reading. Until I get the blog rolling, I hope you'll poke around the rest of the site, explore the projects sections, and let me know what you think.